Thoughts on giving children a greater say - My thoughts upon the plan to give children access to judges. Proposed domestic violence reforms - My view upon the recent proposals. 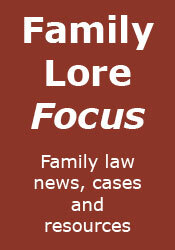 The road to war - Parents involved in continuous litigation, in the case AL v DA. Important cases: White v White - A look at one of the most important cases of all.